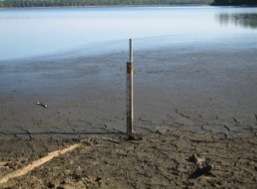 This photo shows low water levels on Wisconsin’s Big Musky Lake. (Phys.org) —For at least the last 70 years, lakes and aquifers in northern Wisconsin have followed the same pattern—after higher than average peaks, water levels spend about 10 years on a downward trend before abruptly spiking up again, only to repeat the decade-long fall back to low-water conditions. The cycle holds true for aquifers and seepage lakes in northern Wisconsin, the gigantic freshwater body formed by lakes Michigan and Huron, and every lake in between. "There was absolutely no reason for us to expect that our little lakes and lakes Michigan and Huron would act the same way, but they did," says Carl Watras, a research scientist with the Wisconsin Department of Natural Resources who is based out of the University of Wisconsin-Madison's Trout Lake Research Station. Watras, is lead author of a report published online today (Tuesday, Jan. 21) in the journal Geophysical Research Letters. The study doesn't just document a 10-year oscillation between high and low water levels—it also shows that current low water levels have seemingly broken from the script. "The lakes [in our study] fell from 1998 all the way to 2010, meaning there was a roughly 12-year decline. And that should have been enough time for the oscillation to go through an up and a down, but it's just been down," he says. In northern Wisconsin, lakes popular for boating and fishing have dropped more than a meter. Cottagers on the Lake Huron shoreline have watched the lake retreat from what was once "waterfront" property, leaving behind mucky stretches of exposed lake bottom where waves once lapped the shore. These dramatic changes have led to a number of theories behind the decline. One popular theory is that dredging in the St. Clair River increased the amount of water flowing out of Lake Huron and into Lake Erie. But, says Watras, while dredging may have had some effect on lake levels, "It's not what's causing low water. Low water is a region-wide, all-inclusive phenomenon," he says. And it's driven by something called circumglobal teleconnection or the "CGT." "Like the jet stream, it's one of these atmospheric patterns that wiggles around," he says. It can drag warm, moist air (and the accompanying rainy weather) up from the Gulf of Mexico, or the CGT can transition to a different pattern and keep that moisture out. During the last 12 years, the CGT didn't wiggle much. And that meant less rainfall to replenish lake levels. Add in increased evaporation brought on by warmer-than-average winters and the resulting drop in ice cover, and the only place for water levels to go was down. "This may be a hiccup," Watras says. "Maybe it'll all go back up. Or maybe we'll go down and eventually reach a lower average water level. Or, maybe this oscillation changes and we get higher highs and lower lows. Frankly, our crystal ball doesn't let us look that far." While researchers can't predict the future, Watras says, they can now better document the present. His study used water level information gathered by the company that regulates dams on the Wisconsin River and data taken by the North Temperate Lakes Long-Term Ecological Research program (LTER). Started by the National Science Foundation in the early 1980's, LTER sites across the United States have systematically recorded data on ecosystems ranging from the New Mexico desert to the Florida Everglades to Wisconsin lakes. Researchers have spent a lot of time, money and effort attempting to explain Great Lakes water levels, Watras says. But it costs far less to keep tabs on smaller inland lakes and, since they follow the same hydrological pattern, they mirror the conditions of the upper Great Lakes. "[Our study] sure does speak well for long-term monitoring of small systems," he says.